I’m working on a revision of my book, How to Write a Picture Book (Look for the new version in September). One section goes through various genres with tips on writing an ABC book, a narrative nonfiction, a picture book mystery, etc. One genre that I neglected in the first draft was metafiction picture books. Me: I need to write a blog post about metafiction picture books. Darling Husband (DH): What’s that? Me: You know. Postmodern stuff. Me: They are books that refer to themselves in some way. They break the concept of “book” in the story itself. Metafiction picture books are those that break the mold by making the reader aware that they are reading a book. Often fiction writers talk about the immersive book, and value stories that transport a reader to a story world and immerse them totally in the story. The reader’s surroundings disappear and they are deeply involved with the story. Metafiction breaks that immersive experience. Why? In the theater, this is referred to as breaking the fourth wall. The stage has a back wall and two wings; the fourth wall is invisible wall that separates the audience from the stage. When an actor turns to the audience and makes comments, it’s breaking the fourth wall. The technique can be used to add information, set up irony, create humor or other purposes. While metafiction isn’t new, it’s been more prevalent in the last few decades. Some say that it’s related to the postmodern philosophy. Read more about postmodernism here. 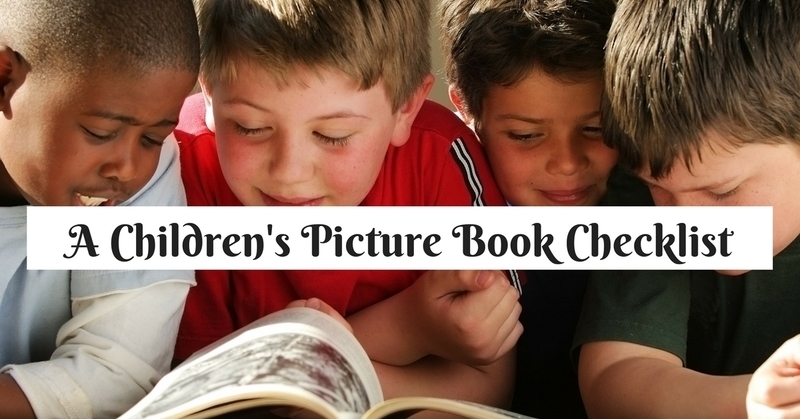 So, what is a metafiction picture book? Let’s look at some characteristics typical of this genre. Of course, you won’t use all of these in any given book. You can mix and match techniques to tell your story (or un-story). The best way to understand these is to read through a variety of the books suggested below. Me: One reason I need to write this is because I’ve been trying to critique some manuscripts and having a hard time. DH: You expect them to be a certain way and they aren’t. Me: Well. Yes. There are rules about writing picture books. Some metafiction picture books refer to folk or fairy tales, often with irony or parody. Pastiche. Copying a certain style of art to create something very different, these are usually author-illustrator stories. Willy the Dreamer by Anthony Browne. Story gaps. Sometimes the text has gaps that require readers to make decisions about the story and its meaning. Academics call this interdeterminancy. The Three Little Pigs by David Wiesner. Direct address to reader. When you use second person point-of-view and talk to the reader, the story can fall into the metafiction category.In a quick review of different points-of-view, you can usually figure out the story’s POV by looking at the pronouns. In Warning! Do Not Open This Book, by Adam Lehrhaupt, the reader is warned against opening the book. When—of course—the child does open the book, the text provides other warnings. Non-linear, non-sequential. Most narratives follow a certain time sequence. This happens first, and then that happens. There’s a beginning, middle and end. However, metafiction picturebooks create stories without a clear reference to time order. In Black and White by David Macaulay, each page is divided into four sections which tell different stories and it’s up to the reader to connect them. Or not. Narrator becomes a character. The author or narrator of the story steps into the story and participates. In Chester, by Melanie Watts, a simple story devolves into an argument between a cat and the author about what story to tell. Unusual book design or layout. Some metaficiton picture books have unusual typography, while others use a layout that breaks the story out of the page or book. Three Little Pigs by David Wiesner, has illustrations showing the pigs folding up a page and climbing out of the story onto a blank page. Or, they fold up a page into a paper airplane and take a ride. Stories within Stories. No Bears by Meg McKinlay, Ella writes a book within the book. Characters and narrators speak directly to the reader. Sandra Boynton’s board book, Moo, Baa, La, La, La. ‘No, no,’ you say, that isn’t right. Characters who comment about their own or other stories. In Chester by Melanie Watt, the author and cat character go back and forth about the story. Among other shenanigans, the cat crosses out the author’s name on the cover and puts his own name. Disruption of time and space relationships. Redwoods by Jason Chin. A boy picks up a nonfiction book about redwood forests and enters the forest. Something makes the readers aware of what makes up a story. In Help! We Need a Title! By Herve Tullet, characters realize someone is watching them (that’s YOU, the reader) and decide to make up a story. In the end, they invite the author to help finish the story. In A Book by Mordecai Gerstein, a girl runs into characters from different genres in a search for her own story. This allows the reader to learn about elements of different genres. Metafiction + Creative nonfiction. 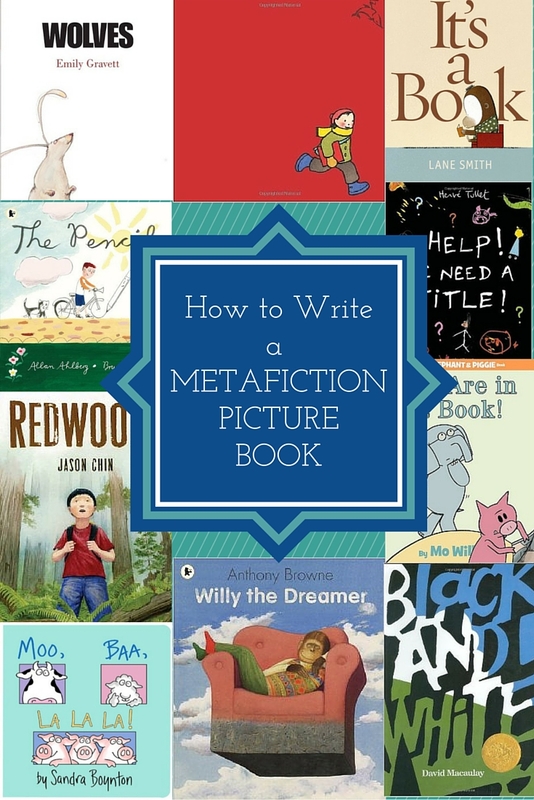 Can you write a metafiction nonfiction picture book? Yes. These stories often mix informational text with fiction. No Monkeys, No Chocolate by Melissa Stewart and Allen Young features a couple of worms who make funny comments while the narrator explains where chocolate comes from. DH: Actually, I do metaficiton. Me: (Slapping forehead) Oh, my goodness. You’re a metafiction storyteller! At least, there’s one in the family. If you’ve read my book, How to Write a Children’s Picture Book, you’ll know most of the “rules” of writing a picture book. Break any rule that’s reasonable for the story, but have a reason to break it. You may want to inject humor, parody, information, or yourself into the story for a good reason. Do it. And do it boldly. While you can write about anything, often the topic of a metafiction picture book is to explain a book or some element of fiction or writing. That’s reflected in titles such as It’s a Book, There are No Cats in This Book, and Who’s Afraid of the Big Bad Book?. Of course, if you try this, remember that you’ll have lots of competition. Make sure these are good read alouds because youngest readers may read these with adults to make sure it’s understood. Read more about how to make your story a good read aloud here. One of the main reasons to write a metafiction picture book is to have fun, to play with the genre. Do something unexpected, disrespectful, funny. DH: Actually, I like a lot of the books you’re calling metafiction. DH: They’re unexpected. A surprise. They make me laugh. Kids love them. An aside: In my household, it’s understood that I don’t have a sense of humor. Slap stick? No, it’s not funny. DH: Of course, it’s hard for you to critique metafiction manuscripts. Authors, give your group (or editor) a heads up. Readers, read the story in front of you. I often read movie or book reviews and get aggravated because the review is more about the reader than the text. The reviewer talks about what they wanted or predicted and how those preconceptions were disappointed. That’s the danger in critiquing this special type of picture book. Especially for metafiction picture books, you must read the text in front of you. Be open to a new way of telling a story for kids. Ann Staman Hollingsworth. Teaching Tips: Fun with Metafiction. July 30, 2015. Many Roads to Reading blog. Nice list of books and teaching tips. 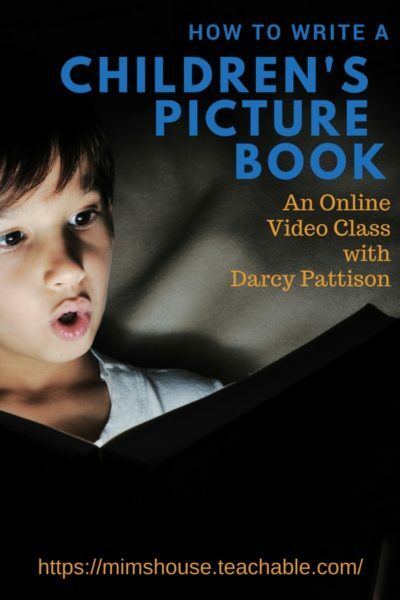 Great explanation of metafiction picture books, including interactive elements, illustrations from selected books, charts and audio. If you’re totally new to this genre, start here. Look for other titles by these authors, too. Child, Lauren. Who’s Afraid of the Big Bad Book? Spiegelman, Art. Open Me. . .I’m a Dog! Tullet, Herve. Help! We Need a Title! What a fine column, Darcy! A wonderful summary of an often difficult topic. Only one point of divergent opinion: done right (and deliberatelty) metafiction can be as, if not more immersive than “traditional” fiction. I’ve always been suspicious of the immersive/non-immersive distinction. Where on the scale side a particular piece of metafiction falls is driven not by the form of expression but the intentionality (and talent) of the author. Interesting point about immersive stories. In general, I find metafiction pulls me out of a story. Do you have an example of where it pulls you deeper into the story? Darcy, wow, so much beautiful info to sift through. Thank you! I can’t wait to buy the new and improved (although, the first How to Write a Children’s Picture Book is nearly perfect). Will share in my Binders FB group. When speaking about immersion, I believe it’s necessary to define the concept if not the term. This goes beyond an appeal to the dictionary. For example, would reader participation in a work of fiction be considered immersion? Or is immersion merely a process of being somatized by story? A discretion call. Another example: web browching. Yes browching: the act of browsing for one thing and branching off into another (and then another, and then another). Some would hold this to be an immersive activity, one that could (and has been) applied to fiction, The process can (and I emphasize can) result in a new and different outcome, one that the reader has a hand (or set of eyes) in producing. But, again: this is not accidental, but intentional on an author’s part and requires great attention to technique. DISCLOSURE: I’m wrestling with reader immersion right now while working on THE HOUDINI KILLER, the prequel to another novel THE ZODIAC DECEPTION. Thanks, Gary, for adding to the conversation. These are complex texts, for sure. And skillful writers can create interesting effects. After reading your post I now realize I love metafiction. Mo Willems and Jon Scieszka are two of my favorite authors. Love, “THE TRUE STORY OF THE 3 LITTLE PIGS!” Thanks for the recommendations of books to study. Thank you for this explanation! I thin I’ve had postmodern mixed up with subversive. Or something like that!